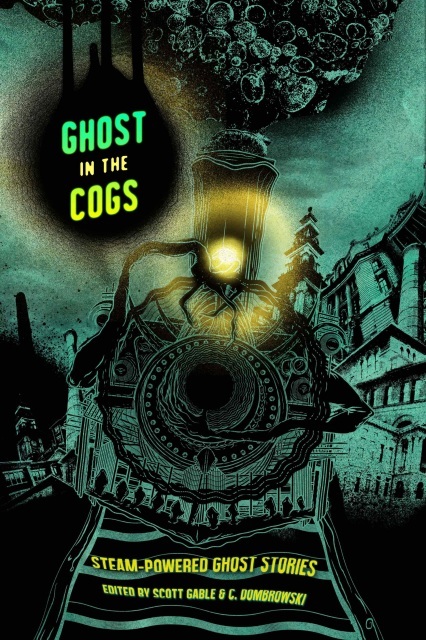 Ghost in the Cogs is edited by Scott Gable and C. Dumbrowski and in their words is a collection of, Steam-Powered Ghost Stories. This Steampunk meeting Horror anthology has 22 stories which cover 240 pages. This was to be the second Broken-Eye anthology I would be reading and since I enjoyed their Cthulhu Mythos publication so much, I had actually saved this one for my big summer vacation to Yellowstone. I like these more focused anthologies, which several companies have been putting out lately. 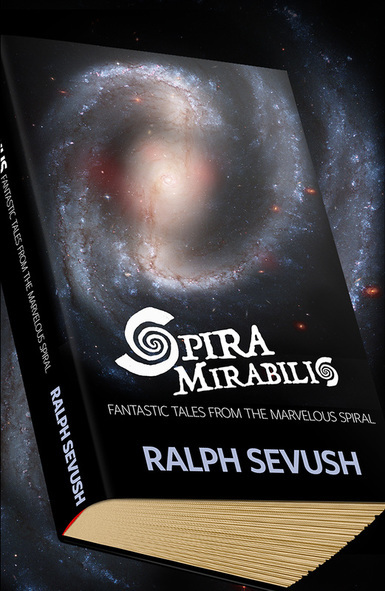 I am also amazed at how many authors come up with stories fitting the vision of the publication. This piece is no exception. There are some fine stories in here and Broken-Eye out together a strong collection. However there were a few weak links near the middle of the anthology. Not every story moved me and leads me to wonder if one of the downsides of these specialized pieces is they have less of a pool to draw their stories from. Since the book contains so many tales, I will hit on some of my favorites. The first story, Asmodeus Flight, by Siobhon Carroll is one of the most action packed adventures in the collection. Effie pilots an airship with a power source dear to her, the soul of her father. So when a villain threatens her craft, it is not just her pride and livelihood he is placing in jeopardy but her father's spirit as well. Just might be payback time. The Misplaced Body of Fitzhugh Alvey is penned by Jessica Corra. This is quite the comedy. The author does a great job personalizing the characters so quickly you feel like you have been reading a whole book about them. Alvey's steam powered invention has more than a bit of a misfire when his spirit returns home without his body. It becomes up to him and his assistant to track it down and he can only hope it is in a state where he will be able to rejoin it. Jonah Buck brings us T-Hex. I love that this starts with the line, "Carthage must be destroyed." I have been to Carthage and yep it was destroyed well. When a machine is invented that brings the soul associated with an object to life, the possibilities for learning could be endless, but what if there is an accident and you bring back something so horrible that it might not be able to be stopped. A lot of action after the suspense is built. Nicely done, although I did foresee the climax. Team 17 by T. Mike McCurly is a more military style adventure where the ghosts are a real danger and need to be controlled and eliminated. The reporter that tags along with this team of Ghost Busters meets marines, quickly finds that he is in way over his head. I also liked The Shadow and the Eye by James Lowder. This one is more odd than action packed, but has great characters. He could write a whole novel spin off here. I loved the inventiveness and interplay between the people. He began creating an interesting world with this one. Cuckoo by Richard Pett was probably the most horrific story. If ghost stories are designed to have to feel unnerved, he did the best job. Scary imagines and scenes occur until you wonder how far into madness the main character has fallen, but how could he not when he's forced to torture machines made of flesh? The last story I'll review was my favorite. Scott Fitzgerald Gray presents The Litany of Waking. Again you feel more like you're reading a novel with this one. 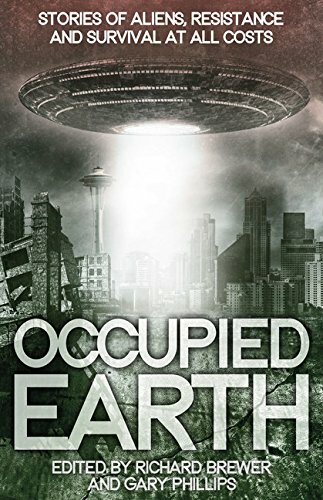 A whole novel compressed into a bite sized adventure that even delivers a moral or is it a message? Salida is confronted by unknown voices when she gets too close to a find that could change her life. Yet, would this change be worth throwing the world into chaos? As I said a strong gathering of tales is presented to us. Possible downsides of this one could be a few weaker tales, which just do not hold up against the general level of excellence so many present. Also in most cases I feel the steampunk overshadowed the ghost aspect. I would have liked to see more true terror strike at the heroes and heroines and not just be more of a side note as to why they have designed a new gadget. I was happy I saved this for my big vacation. It was fun to read on the road and during my down times. I think all lovers of Steampunk would enjoy this anthology. If you do not like horror, I would not let the title put you off, just enough rattling to make things fun. Good idea and they pulled through and delivered. So what's next Broken-eye?